After the stitching weekend, I had a visit from my dear Mum for a couple of weeks which normally means lots of stitching time, but instead we were out and about seeing the sights and no stitching at all. After she’d gone home, though, I made up for lost time, and the last month or so has seen me working on a WIP that I started early last year. After putting this into my Qsnaps I haven’t felt like working on anything else, and I’ve just kept plugging away at it until two days ago when I put the final stitches into it – woohoo, a HUGE happy dance happened at home, that’s for sure! Here’s my 2nd finished HAED hot off the Qsnaps. Monica Hunt: Hussif – 95% – this only needs the feather stitching done to attach the pieces together, and to add the button etc, all the individual pieces are completed. It’s quite pathetic why I haven’t done this one yet! Homespun Elegance: Starry Snowman – 90% – this will only take an hour or so to finish, I think I just keep forgetting it’s there. CA Wells: Sailors Valentine – 85% – I need to be in a good headspace to get back into the groove with this piece, and can’t even remember how to do the simple joining stitch, so I feel intimated by this one, especially with the finishing! 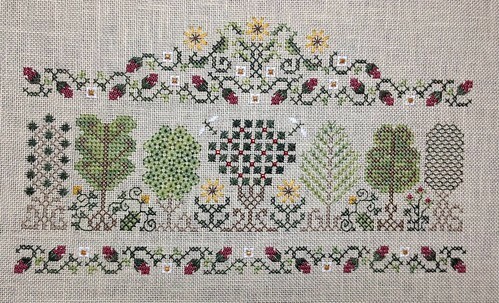 Teresa Wentzler: English Garden Sampler – 80% – I want to replace the alphabet with a nice saying, but can’t make a decision which saying to use. Cindy Valentine: Bee Keeper Scissor Keeper & Fob – 80% – the scissor keeper is finished, I just need to stitch the matching fob which shouldn’t take that long to do. Jane Nicholas (stumpwork): Stumpwork needlework accessories (thimble pip) – 80% – I’ve lost my stumpwork mojo and really need to find it again! I’m not 100% happy with the tension on this one or the fabric used, and not 100% sure this will ever get completed because of that reason. Ruth Schmuff Designs: Flight of the Bumblebees – 80% – I was waiting for a skein of Kreinik #8 to arrive, which it now has, so this will be joining my stitching list very soon, watch this space! CA Wells: Cottage Etui – 75% – see the Sailors Valentine above. Stoney Creek: Nature’s Resting Place – 70% – there are so many mistakes in this one it’s not funny – also the very first piece stitched on evenweave so about 30 years old and using older DMC colours – not sure I can be bothered salvaging this one. Mediterranean Village scene – 70% – not in love with this at all, tried changing the colours from Anchor and don’t like the choices – not sure it’ll ever be finished. Jane Nicholas (stumpwork): Dragonfly – 70% – see thimblepip above. Jane Nicholas (stumpwork): Honesty & Heartsease – 70% – see thimblepip above. Cindy Valentine: Apricot Elegance – 65% – unpicked the buttonhole edging so many times it isn’t funny, so it was thrown into the naughty corner over 10 years ago. Hardanger Scissor Fob – 60% – not sure why this isn’t finished yet, it won’t take too long to do. Berry Delightful bag – 60% – not feeling the love. Beaded fish – 50% – can’t remember how to do the stitches! CA Wells: Pyramid Etui – 50% – see the Sailors Valentine above. Wool hotwater bottle cover – 50% – don’t like the colours chosen, and want to start again. Summer Fruits pincushion – 40% – not feeling the love. Jane Nicholas (stumpwork): Oriental Poppy – 40% – see thimblepip above. Jane Nicholas (stumpwork): Pomegranates and Beetle – 35% – see thimblepip above. Teresa Wentzler: Noah’s Ark – 35% – too many other things I love more. Wool beehive needlebook – 35% – not sure why I stopped this one. Chatelaine: Egyptian Garden Mandala – 35% – really dislike the fabric chosen, but gradually adding a few stitches this year as I’m determined to finish it if only because I spent so much money on the kit! Shepherd’s Bush: Finch Song – 20% – missing some threads to kit it up (the chart was secondhand from a friend on loan). ByGone Stitches: Quaker Christmas II – 20% – not 100% keen on my fabric choice, but I do a few stitches every now and then. Country Threads: Paris – 20% – a newer UFO that will see daylight every now and then. One letter down, four to go. Goldwork pea – 15% – I made a mistake right at the start, and not sure it can be fixed. JCS magazine: Le Jardin Silk Sampler – 10% – really hate stitching with the Silk Serica, so it stalled and I haven’t picked it back up again. Martha Schmidt: Hussif – 5% – don’t like my thread choices, and want to start again. Rosewood Manor: Quaker Diamonds – 5% – love this one, just other projects have jumped up the priority queue – hope to do a bit more of this one this year. Textile Heritage: Topiary Bookmark – 5% – can’t stitch in hand, so I need to attach somehow to a frame. 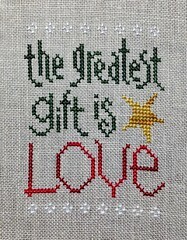 Forget-Me-Nots in Stitches: Raphael’s Raspberries – 5% – just got side-tracked with other projects. Moss Creek Designs: Schwalmwork Pinkeep – 1% – got side-tracked with other projects I like better. 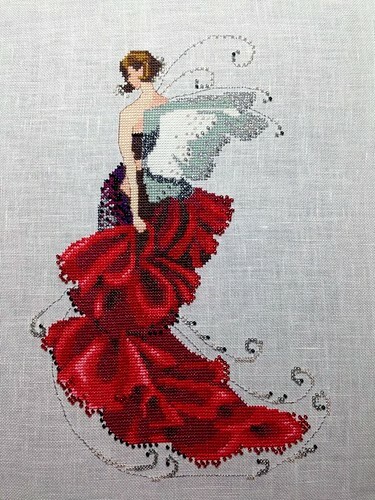 Mirabilia: Bluebeard’s Princess Mirabella – 1% – dislike my fabric choice, and want to start again. Lavender & Lace: Celtic Summer – 1% – can’t decide what threads to use to replace the duck-egg blue Needlepaint ones that are no longer available. Country Cottage Needleworks: The Tea Room – 1% – not sure why I haven’t done any more on this one. Longstitch frogs – 1% – I just fell out of love with this one, and don’t enjoy doing longstitch anymore – I should really just give it away. The blue recliner in the bottom corner is my stitching chair in my lounge – it usually sits a bit more off to the left, and you’ll normally find me watching TV or with my iPad plugged in listening to audiobooks. Actually the room has had a small shuffle since this photo was taken a few months ago, but it’s close enough to how it is today anyway. While I was away at Christmas I managed to start the following two new projects (I took those because they were relatively easy to stitch so I didn’t have to concentrate on them 100% while being distracted by the TV and chatting to company). First up was Red Lace Sewing Case by The Drawn Thread. Sadly I ran out of thread for this one, stupidly thinking one skein of Gloriana silk would be enough, and no doubt a replacement skein won’t match the same dyelot, but I’ll have to wait and see once I get around to a stitching order. I was surprised just how quickly that design chewed through the skein of Gloriana! This will eventually be going to a new home (hence the hiding of the letter in the centre), so hopefully it won’t look too bad when the new skein arrives … The only change I made was to use two strands of silk for the alphabet – I used one initially as per the design instructions, but I hated the look of it, so doubled the strands (sadly that wasn’t the reason for running out).